Publisher Fast Forward Entertainment. Released Fall 2001. Format Softcover. Game system d20. Setting Green Races. Levels 4-7. Pages 48. Price $12.95. Once in a lifetime, there comes a roleplaying product so grand in scope as to put all other competitors to shame. It shatters our conceptions of what a roleplaying game can be, and it shows us new ways of looking at our hobby. It is balanced, has innovative new rules or interesting takes on existing mechanics. It has a riveting plot which allows great freedom for the players’ PCs to get involved and change the outcome of the story. The Temple of the Troll God is the anti-thesis of that product. Released in fall 2001, this product hasn’t aged well. Heck, it got hit by a ghost’s aging touch the second it hit the shops. I know it’s very much too late to review this adventure now, but I do so for several reasons. First, I had already written a review years ago so I might as well use that again now that I’m launching FAL. Second, it will help you all to start figuring out what I like and what I don’t like. 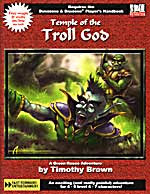 The Temple of the Troll God is part of a trilogy (made up of Fortress of the Ogre Chieftain, Temple of the Troll God and Slave Pits of the Goblin King), but can be played by itself. It is set in the setting of the Green Races, on a world called Elara. The layout is simplistic, the maps are under average and the illustrations of low quality. The structure of the text is incredibly confusing and freely mixes text on the adventure, the rules and the “unique” setting. All in all it feels like a train off the rails; it lacks direction and is heading towards a train wreck. A premise for the adventure doesn’t exist. There is no plot, no reason for why the PCs would be where they are, there is no logic to what’s going on or why anything happens. Somewhere among all this is a temple dedicated to a god worshiped by trolls, and this is where the PCs are going to … do something, I suppose. No one knows what, not even the DM. These kinds of setups exist in other adventures as well, basically offering the DM a framework to use with his players’ PCs. I find many modules with that premise interesting, but The Temple of the Troll God was merely frustrating. It seems as if Brown wrote an adventure that was supposed to be both framework and a linear wilderness plus dungeon romp, but that half of the text got chewed up by a hard drive crash. The execution of the rules is also a catastrophe, and there are many gigantic mistakes regarding monster stats and abilities. In addition to this, the writer consequently breaks the terms of the d20 license throughout the text. In addition to this, the amount of treasure placed in this adventure borders on the ludicrous. What makes this offering so crushingly disappointing is the fact that several of the old AD&D guard were involved in its creation. I admired Timothy Browns work on Dark Sun, and always figured that Jim Ward had a lot going for him. But these illusions were backstabbed and disintegrated and then cast into the abyss. Temple of the Troll God feels like a quick hatchet job to cash in on the, at the time, very profitable d20 trend. I wouldn’t be surprised if it was revealed that the adventure was simply some discarded or even rejected notes from the AD&D era, dressed up in a tutu and brought to the prom, without Brown ever reading the third edition rules or the licenses attached to it. Harsh? Yeah, maybe. I have read a rave review of this adventure on RPGnet, so there are people out there who disagree with my assessment. So should you buy it? Hell, yeah! If you can find it for a dollar, pick it up. There are several lessons to be learned from The Temple of the Troll God, and having it in your possession will give you new faith in the products offered for D&D and d20 today. Previous Article Warhammer Fantasy Roleplay awarded again! Next Article What’s going on?